Situated at the foothills of the beautiful Alps, the Bright Country Golf Club is a unique 18 hole golf course designed by Tony Cashmore. A par 72, 6097 metre course with manicured grass greens and beautifully developed tree lined fairways. Course features include: fully equipped golf shop, clubs, motorized carts and push buggies available for hire, licensed clubhouse and regular competitions. A warm welcome is extended to all visitors so come and enjoy a stroll on the green. Located in beautiful Myrtleford, with 18 Superb Grass Greens and watered couch grass fairways you will love playing on this fantastic course! Course features Grass Greens, Practice Fairway, Shower, Food and Drink. Visitors & groups most welcome - if no one is available a self service system has been set up, memberships also available. Unwind with a stroll on the fairway... go and visit the Myrtleford Golf Club for your next round of golf!! Mini Golf available at Wandiligong maze and Cafe and also Bright Holiday Park so challenge the family to a game in their unique courses today! Our course is a picturesque 18 holes with grass greens situated at the base of the Bogong High Plains, offering magnificent views of the Alps and the beautiful Kiewa Valley. The course offers a challenge for good golfers as well as being beginner friendly. The Green Fees are moderate and clubs, golf bags and clubs and pull buggies may be hired at reasonable rates. After your game, relax on the deck of our licensed clubroom with a refreshing drink (competition days only). Anybody with a handicap is most welcome to play in our comps on Wednesdays, Saturdays or Sundays for both Men and Ladies, or anyone can enjoy a social game any day of the week. Mount Beauty golf club welcomes all visitors! The Mt Beauty Golf Club is affiliated with the VGA & the WGV. 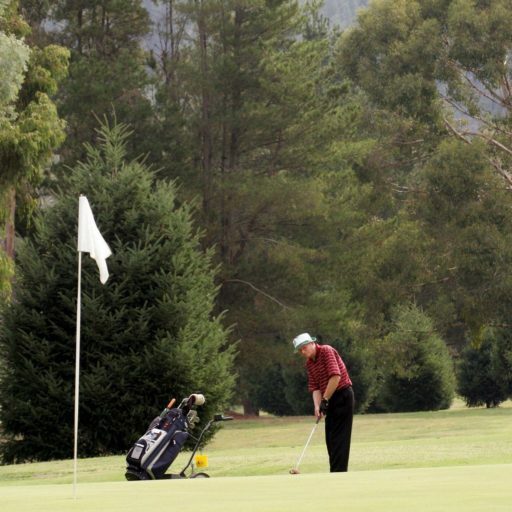 Enjoy a fun day out and relax at the Dederang Golf Club situated on the Kiewa Highway. Vistors are more than welcomed. Its a 9 hole sand scrapes course which works on an honesty system, and by prior arrangement equipment can be hired. Their competition runs from March - Sept, and in Summer. So go along, relax and unwind.